Peter Tompkins and Christopher Bird wrote a path breaking book – “The secret lives of plants” - A Fascinating Account of the Physical, Emotional, and Spiritual Relations Between Plants and Man. The whole village had gathered in the garden of the sculptor. They had got used to him, to the chiseling, the hammering, the chipping and the scraping. 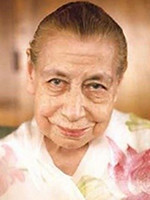 Mother of Sri Aurobindo Ashram was to visit one of the departments. Naturally the person in-charge tidied up things and all was kept spick and span. Old and ungainly items were all stacked together in the shed in a corner of the compound. Ivan Illich was a Croatian-Austrian philosopher, a rebellious priest, and critical of the institutions of modern Western culture. “There is an ascending evolution in nature which goes from the stone to the plant, from the plant to the animal, from the animal to man. Because man is, for the moment, the last rung at the summit of the ascending evolution, he considers himself as the final stage in this ascension and believes there can be nothing on earth superior to him. George Washington Carver was an American botanist and inventor. He became well-known to the public due to his active promotion of alternative crops to cotton and methods to prevent soil depletion.